Package Include:1 Silver case + 1 Rose-gold case + 1 Gold case. Special Advantage:our watch case do not have the line flaw around the case edges. pectfect electroplate design makes your watch looks more High end and Durable. would never become fade and yellow. About Belyoung:Belyoung is a brand that devote to providing our customer the most high quality and strong functional products. Customer Service:Belyoung takes care of all quality-related issues with a REPLACEMENT or REFUND. Any problem, please feel free to contact us. Haha, get this case for your watch now. 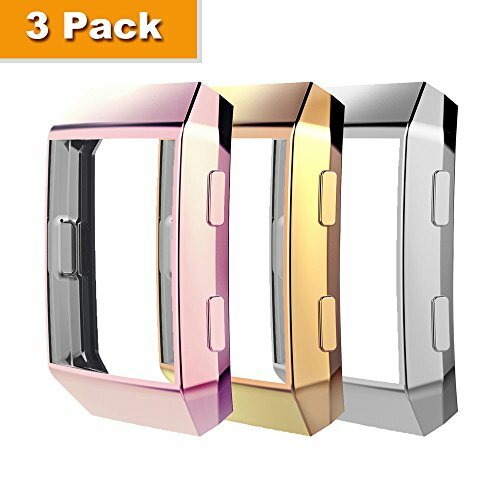 Material: Soft TPU case give you fine touch feeling, this fitbit ionic case just cover the curved edges of the watch, not cover the watch screen full front, also could protect the edge of your fitbit ionic from scratches, drop, bump and so on. Special Advantage: our fitbit ionic case do not have the line around the case edges. pectfect electroplate design makes your watch looks more High end and Durable. never be fading or peeling. Application: Design for fitbit ionic smart watch. very easy to put on and take off. Your watch could be charged with the case on. Package Include: 3 pack of this case as the picture.